The Honor View 20 will be the first phone in India to launch with a punch-hole camera and a 48MP main camera setup. Honor View 20 to be the first phone in India with a punch hole design and a 48MP camera. The device sports the ‘Link Turbo’ technology that is said to enable faster download speeds. After the global unveiling of its latest flagship smartphone, the Honor View 20, in Paris on January 22, Honor is all set to launch the device in India today. The new smartphone features a nearly bezel-less design and comes with a punch-hole camera. It features a dual rear camera setup and it will be the first smartphone in India to sport a 48MP main camera sensor and the first one to come with a punch hole camera. The handset is also touted to come with the ‘Link Turbo’ technology, which the company claims enables faster download speeds by leveraging both Wi-Fi and cellular connectivity. Honor will live stream today’s launch event of the Honor View 20 via its various social media channels. The live stream can be watched from the company’s YouTube, Facebook and Twitter accounts but you can watch it directly from the video embedded below. Do note that the event is slated to go live at 12:30 PM today. The Honor View 20 sports a 6.4-inch Full HD+ All-View display that has a resolution of 2310x1080 pixels. As mentioned above, the All-View display is almost bezel-less but it sports a punch hole that houses the selfie camera. This setup is similar to what we have already seen on the Samsung’s Galaxy A8s and the South Korean company calls it the Infinity-O display. Huawei says that the circular cutout on the top left corner is 4.5mm in diameter. On the back of the phone is a glass panel with a V-shaped pattern under the glass. The Honor View 20 is powered by an octa-core HiSilicon Kirin 980 flagship chipset, which is manufactured using a 7nm process. This the same chipset that powers the Huawei Mate 20 Pro. The device also comes with GPU Turbo 2.0 technology that the company claims boosts performance and graphics during gaming sessions. The View 20 comes equipped with a liquid cooling system to keep the CPU temperature in check. The phone comes with 8GB RAM, coupled with 256GB of internal storage. In terms of optics, the phone features a dual-rear camera setup that consists of a 48MP Sony IMX586 CMOS primary sensor that uses pixel-binning technology to give a 1.6-micron pixel. The second sensor is a Time-Of-Flight (TOF) sensor that is used to capture depth. On the front, the punch-hole camera houses a 25MP sensor with f/2.0 aperture. The device is backed by a 4000mAh battery with fast charge support. The Honor View 20 runs Android Pie 9.0 with Magic UI 2.0 on top. 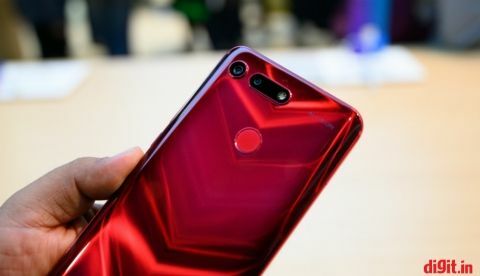 While there is no concrete information on how much the Honor View 20 could be priced at, a previous report suggested that the company might launch it at Rs 35,999 in India. In Europe, the 6GB RAM + 128GB storage variant of the phone is priced at 569 euros (Rs 46,000 approx) and the 8GB RAM + 256GB storage variant costs 649 euros (Rs 52,500 approx). In China, the phone costs CNY 2999 (Rs 30,000 approx) for the 6GB RAM + 128GB storage variant and CNY 3499 (Rs 35,500 approx) for the 8GB RAM + 128GB storage variant. It seems like the company could only announce the 8GB RAM variant of the phone. 1. For one who is interested in pre-booking the Honor View 20 from Amazon.in, they need to visit the phone’s E-mail Gift Card page here. 2. They need to choose the denomination of Rs 1,000 for the E-mail Gift Card and enter their email address. 3. Add this E-mail Gift Card to the cart and complete the payment to receive the Gift Card in the email address entered in the previous step. 4. They then need to buy the Honor View 20 only on January 30 and use the E-mail Gift Card code received in the 'Promotions Codes' section at checkout. They can also add the Gift Card to their Amazon Pay Balance account and use the balance against the purchase of the Honor View 20 smartphone. 5. After this, they will receive a coupon code on their email id registered with your Amazon account on or before February 15. This coupon code can be used to purchase the "Honor AM61 Sport Bluetooth Earphones" free of cost. 6. Follow the instructions in the e-mail and apply the given code at the checkout page to avail the Earphones for free.